This article is about the British composer and rock musician. For other people with a similar name, see John Greenwood. Jonathan Richard Guy "Jonny" Greenwood (born 5 November 1971) is an English musician and composer best known as the lead guitarist and keyboardist of the alternative rock band Radiohead. A multi-instrumentalist, Greenwood also plays instruments including the bass guitar, piano, viola, and drums, and is a prominent player of the ondes Martenot, an early electronic instrument. He works with electronic techniques such as programming, sampling and looping, and writes music software used by Radiohead. He described his role in the band as an arranger, helping to transform singer Thom Yorke's demos into full songs. He has been named one of the greatest guitarists of all time by publications including the NME, Rolling Stone and Spin. Greenwood was born in Oxford, England. As a boy he played in youth orchestras, and he is the only Radiohead member to have studied music theory. Along with his older brother, Radiohead bassist Colin, he attended Abingdon School, where he met the other members of Radiohead. The youngest of the group, Greenwood was the last to join, playing first keyboards and harmonica but soon becoming lead guitarist. He abandoned a degree in music when Radiohead signed to Parlophone; their debut single "Creep" was distinguished by Greenwood's aggressive guitar work, and Radiohead have gone on to achieve critical acclaim and sales of over 30 million albums. Greenwood first composed for orchestra during the recording of Radiohead's fourth album, Kid A (2000). Subsequent Radiohead albums have featured his string and brass arrangements, and he has since composed for orchestras including the London Contemporary Orchestra and the BBC Concert Orchestra. He released his first solo work, the soundtrack for the film Bodysong, in 2003, and has since scored the films There Will Be Blood (2007), Norwegian Wood (2010), We Need To Talk About Kevin (2011), The Master (2012) and Inherent Vice (2014), working with director Paul Thomas Anderson on several occasions. He has collaborated with musicians including Israeli composer Shye Ben Tzur, singer Bryan Ferry, rapper MF Doom, and singer Frank Ocean. 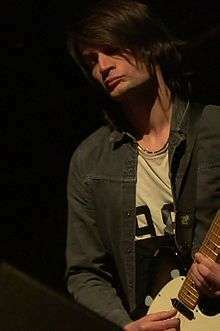 Jonny Greenwood was born on 5 November 1971 in Oxford, England. He is the younger brother of Radiohead bassist Colin Greenwood, who is two years older. His father served in the army as a bomb disposal expert. When he was a child, Greenwood's family would listen to a small number of cassettes in their car, including Mozart’s horn concertos, the musicals Flower Drum Song and My Fair Lady, and cover versions of Simon and Garfunkel songs. When the cassettes were not playing, Greenwood would listen to the noise of the engine and try to recall every detail of the music. He credited his sister, ten years his senior, and his brother Colin with exposing him to rock bands such as the Beat and New Order. "I was never happier," he says, "than when I was in my bedroom as a kid, working on rubbishy computer games." Greenwood's first instrument was a recorder given to him at age four or five. He took the instrument seriously, playing it into adulthood, and played baroque music in recorder groups as a teenager. He also learnt the viola and joined the Thames Vale Youth Orchestra, which he described as a formative experience: "I'd been in school orchestras and never seen the point. But in Thames Vale I was suddenly with all these 18-year-olds who could actually play in tune. I remember thinking: 'Ah, that’s what an orchestra is supposed to sound like!'" The first gig he attended was the Fall on their 1988 Frenz Experiment tour, which he found "overwhelming". Along with Colin, Greenwood attended the private boys' school Abingdon School, where he met singer Thom Yorke, guitarist Ed O'Brien, and drummer Phil Selway and joined their band On a Friday. He had previously been in a band called Illiterate Hands with Nigel Powell and Yorke's brother Andy Yorke. The youngest member of On a Friday, Greenwood was two school years below Yorke and Colin and the last to join. He first played harmonica and then keyboards, but soon became the lead guitarist. Greenwood studied music at A-level, where he learnt how to harmonise Bach chorales, a skill he said he still uses. Greenwood was three weeks into a degree in music and psychology at Oxford Brookes University when On a Friday signed a recording contract with EMI in 1991. He dropped out of university and On a Friday changed their name to Radiohead. The band found early success with their 1992 single "Creep". According to Rolling Stone, "it was Greenwood's gnashing noise blasts that marked Radiohead as more than just another mopey band ... [it was] an early indicator of his crucial role in pushing his band forward." Radiohead's third album, OK Computer (1997), propelled them to international fame, and is often acclaimed as one of the best albums of all time; it showcased Greenwood's lead guitar work on songs such as "Paranoid Android". For the track "Climbing up the Walls", Greenwood wrote a part for 16 stringed instruments playing quarter-tones apart, inspired by the Polish composer Krzysztof Penderecki. Radiohead's fourth and fifth albums, Kid A (2000) and Amnesiac (2001), recorded simultaneously, marked a dramatic change in sound, incorporating influences from electronic music, classical music, jazz and krautrock. Among the instruments used by Greenwood for the album were modular synthesisers (used to build the drum machine rhythm of "Idioteque") and the ondes Martenot, an early synthesiser similar to a theremin. The albums also gave Greenwood his first opportunity to work with an orchestra, the Orchestra of St John's. The only Radiohead member trained in music theory, Greenwood composed a string arrangement for "How to Disappear Completely" by multitracking his ondes Martenot playing. According to Nigel Godrich, Radiohead’s longtime producer, the first time the musicians saw Greenwood's score "they all just sort of burst into giggles, because they couldn’t do what he’d written, because it was impossible — or impossible for them, anyway." Greenwood said that the orchestra leader, John Lubbock, encouraged the musicians to experiment and work with his "naive" ideas. In 2003, Radiohead released their sixth album, Hail to the Thief, a blend of rock and electronic music. At the 2005 Ether Festival, Greenwood and Yorke performed "Arpeggi" with the London Sinfonietta orchestra and the Arab Orchestra of Nazareth; the song was released in a different arrangement on Radiohead's seventh album, In Rainbows (2007), retitled "Weird Fishes/Arpeggi". In February 2011, Radiohead self-released their eighth album, The King of Limbs, recorded using sampler software written by Greenwood. Radiohead's ninth studio album, A Moon Shaped Pool, released in May 2016, heavily features strings and choral vocals arranged by Greenwood and performed by the London Contemporary Orchestra. In 2003, Greenwood released his first solo work, Bodysong, the soundtrack for the documentary of the same name, featuring his brother and Radiohead bandmate Colin on bass. The soundtrack includes guitar, classical music, and jazz. In March 2004, Greenwood's first work for orchestra, Smear, was premiered by the London Sinfonietta. In May, he was appointed composer-in-residence to the BBC Concert Orchestra, for whom he wrote "Popcorn Superhet Receiver" (2005), which won the Radio 3 Listeners' Award at the 2006 BBC British Composer Awards. The piece was inspired by radio static and the elaborate, dissonant tone clusters of Penderecki's Threnody to the Victims of Hiroshima (1960). He wrote the piece by recording individual tones on viola, then manipulating and overdubbing them in Pro Tools. As part of his prize Greenwood received £10,000 from the PRS Foundation towards a commission for a new orchestral work. Greenwood composed score for the 2007 film There Will Be Blood by director Paul Thomas Anderson. The soundtrack won an award at the Critics' Choice Awards and the Best Film Score trophy in the Evening Standard British Film Awards for 2007. As the soundtrack contains excerpts from "Popcorn Superhet Receiver", it was ineligible for an Academy Award nomination, which prohibits "scores diluted by the use of tracked themes or other pre-existing music." Rolling Stone later named There Will Be Blood the best film of the decade and described the score as "a sonic explosion that reinvented what film music could be". In 2016, film composer Hans Zimmer said the score was the one that had most "stood out to him" in the past decade, describing it as "recklessly, crazily beautful". Greenwood curated a compilation album of reggae tracks, Jonny Greenwood Is the Controller, released by Trojan Records in March 2007. The album features mostly 70s roots and dub tracks from artists including Lee "Scratch" Perry, Joe Gibbs, and Linval Thompson; the title references Thompson's track "Dread Are the Controller". In 2008, Greenwood wrote the title music for Adam Buxton's sketch show pilot meeBOX. In February 2010, he debuted a new composition, "Doghouse", at the BBC's Maida Vale Studios. Greenwood wrote the piece in hotels and dressing rooms while on tour with Radiohead. He expanded "Doghouse" into the score for the Japanese film Norwegian Wood released later that year, based on the novel of the same name by Haruki Murakami. In 2011, Greenwood composed the score for We Need to Talk About Kevin, a film based on the novel of the same name by Lionel Shriver, using instruments including a wire-strung harp. In 2012, he worked with Anderson again, composing the score for The Master. On 13 March 2012, Greenwood and Polish composer Krzysztof Penderecki released an album comprising Penderecki's 1960s compositions Polymorphia and Threnody for the Victims of Hiroshima, Greenwood's "Popcorn Superhet Receiver", and a new work by Greenwood, "48 Responses to Polymorphia". In 2012, Greenwood accepted a three-month residency with the Australian Chamber Orchestra in Sydney and composed a new piece, "Water". Greenwood collaborated with Anderson again on the soundtrack for the film Inherent Vice, released in October 2014; it features a new version of an unreleased Radiohead song, "Spooks", performed by Greenwood and two members of Supergrass. In 2014, Greenwood performed with the London Contemporary Orchestra, performing selections from his soundtracks alongside new compositions. Greenwood played harmonica on Blind Mr. Jones's 1992 single "Crazy Jazz". For the 1998 film Velvet Goldmine, he formed Venus in Furs with Radiohead's Thom Yorke, Suede's Bernard Butler, and Roxy Music's Andy Mackay and recorded covers of the Roxy Music songs "2HB", "Ladytron" and "Bitter-Sweet". Greenwood played harmonica on the tracks "Platform Blues" and "Billie" on Pavement's final album, Terror Twilight (1999), produced by Radiohead producer Nigel Godrich. He played guitar on Bryan Ferry's albums and Frantic (2002) and Olympia (2010). For the 2005 film Harry Potter and the Goblet of Fire, Greenwood appeared as part of the wizard rock band Weird Sisters with Radiohead drummer Phil Selway, former Pulp members Jarvis Cocker and Steve Mackey, electronica artist Jason Buckle and Add N to (X) member Steven Claydon. In 2008, Greenwood collaborated with Israeli rock musician Dudu Tasa on the Hebrew-language single "What a Day". In 2011, he and Yorke collaborated with rapper MF Doom on the track "Retarded Fren". In 2014, Greenwood performed with Israeli composer Shye Ben Tzur and his band. Greenwood described Tzur's music as "quite celebratory, more like gospel music than anything — except that it’s all done to a backing of Indian harmoniums and percussion." In 2015, Greenwood, Tzur and Radiohead producer Nigel Godrich recorded an album, Junun, with a group of Indian musicians at the 15th-century Mehrangarh Fort in the Indian state of Rajasthan. The sessions were filmed by Paul Thomas Anderson for his documentary of the same name, which premièred at the 2015 New York Film Festival. In 2016, Greenwood contributed string orchestration to Frank Ocean's albums Endless and Blonde. Greenwood is influenced by music genres including jazz, classical rock, reggae, hip-hop, and electronic music. His jazz favourites include Lee Morgan, Alice Coltrane and Miles Davis. Along with the other members of Radiohead, he admires Scott Walker, Krautrock band Can, and Sonic Youth. Greenwood first heard Olivier Messiaen's Turangalîla Symphony at the age of 15 and became "round-the-bend-obsessed with it". Messiaen was Greenwood's "first connection" to classical music, and remains an influence; he said: "He was still alive when I was 15, and for whatever reason I felt I could equate him with my other favourite bands – there was no big posthumous reputation to put me off. So I'm still very fond of writing things in the same modes of limited transposition that he used." He is an admirer of Polish composer Krzysztof Penderecki, and cited a concert of Penderecki's music in the early 90s as a "conversion experience". He is also a fan of the minimalist composer Steve Reich. Having performed Reich's composition Electric Counterpoint on guitar, he recorded a version for Reich's 2014 album Radio Rewrite. Greenwood is a fan of the 80s post-punk band Magazine. He declined an offer to fill in for guitarist John McGeoch, who died in 2004, during the band's 2012 reunion tour. According to Radiohead collaborator Adam Buxton, "I think Jonny was just overwhelmed, cause he's the biggest Magazine fan in the world. He was just too shy, I think. I'm sure he's got all those licks in his locker." Greenwood is a multi-instrumentalist and plays instruments including guitar, piano, synthesisers, viola, glockenspiel, harmonica, recorder, organ, and banjo. He said in 2014: "I'm always happiest trying new instruments - and honestly enjoy playing, say, the glockenspiel with Radiohead as much as I do the guitar ... I enjoy struggling with instruments I can't really play." Along with the other members of Radiohead, he often uses electronic instruments. He created the rhythm for "Idioteque" (from Kid A) with a modular synthesiser and sampled the song's four-chord synthesiser phrase from a computer music piece by Paul Lansky. He uses a Kaoss Pad to record, manipulate and play back Yorke's vocals during performances of "Everything in its Right Place". He has also used found sounds, using a television and a radio transistor on "Climbing Up the Walls" (from OK Computer) and "The National Anthem" (from Kid A). Greenwood is a prominent player of the ondes Martenot, an early French electronic instrument played by moving a ring along a wire, creating sounds similar to a theremin. The instrument appears on tracks such as "How to Disappear Completely" (from Kid A) and "Where I End and You Begin" (from Hail to the Thief). Greenwood became interested in the instrument at the age of 15 after hearing Olivier Messiaen's Turangalîla Symphony. He is interviewed by Suzanne Binet-Audet about his affection for the instrument in the 2012 documentary Wavemakers. 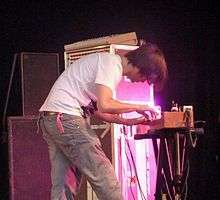 As original production of the ondes Martenot ceased in 1988, Greenwood had a replica created to take on tour with Radiohead in 2001 for fear of damaging his original model. "You know, people from my background are made to feel that it’s wrong to have opinions about classical music ... So I found it quite healthy, particularly at school, to think about classical composers and rock bands in the same way. The reason I loved Messiaen, for instance, was that he was still alive and writing. To me that was as exciting as a great old rock band still being around. Same with Penderecki. His strange orchestral music was quite dark, but it felt similar to the strange electronic music coming out of Manchester." In 2014, Greenwood wrote of his fascination with Indian instruments, particularly the tanpura: "Supposedly they’re just drones to accompany singers but in fact they produce a compellingly complex wall of sound, with layer upon layer of drifting harmonics. I’ve started using some of these instruments in my music because I can’t think of any other way, electronics included, of making such sounds." For his film soundtracks, Greenwood attempts to keep the instrumentation contemporary to the period of the story; for example, he recorded the Norwegian Wood soundtrack using a 1960s Japanese nylon-strung guitar and recorded it with period home recording equipment, attempting to create a recording that one of the characters might have made. Many of his compositions are microtonal. Greenwood is a computer programmer and writes software used in Radiohead's music. He became interested in programming when he was young, experimenting with BASIC and simple machine code, and said: "The closer I got to the bare bones of the computer, the more exciting I found it." At the suggestion of Radiohead producer Nigel Godrich, Greenwood began using the music programming language Max. He said: "I got to reconnect properly with computers ... I didn't have to use someone else's idea of what a delay, or a reverb, or a sequencer should do, or should sound like – I could start from the ground, and think in terms of sound and maths. It was like coming off the rails." Greenwood wrote the software Radiohead used to sample their playing for their eighth album, The King of Limbs (2011). Greenwood's major writing contributions to Radiohead's early records include "Just" (which Yorke described as "a competition by me and Jonny to get as many chords as possible into a song") and "My Iron Lung" (which Yorke co-wrote with Greenwood) from The Bends (1995), "The Tourist" and the "rain down" bridge of "Paranoid Android" from OK Computer (1997), and the vocal melody of "Kid A" from Kid A (2000). The New York Times described Greenwood role as "the guy who can take an abstract Thom Yorke notion and master the tools required to execute it in the real world." Greenwood described his role in the band as arranger: "It's not really about can I do my guitar part now, it's more ... what will serve this song best? How do we not mess up this really good song? Part of the problem is Thom will sit at the piano and play a song like 'Pyramid Song' and we're going to record it and how do we not make it worse, how do we make it better than him just playing it by himself, which is already usually quite great." Asked about working with Greenwood, Yorke said: "Whenever I am tired, he is there and awake." Greenwood has long used a rewired Fender Telecaster Plus with Lace Sensor pickups; his other guitars include a mid-seventies Fender Starcaster and a Gibson Les Paul. He is known for his aggressive playing style; in the 1990s, his playing gave him repetitive stress injury, necessitating a brace on his right arm, which he likened to "taping up your fingers before a boxing match." He often uses effect pedals and sometimes plays with a violin bow. He dislikes the reputation of guitars as something to be "admired or worshipped", saying he sees them as a tool like a typewriter or a vacuum cleaner. In 2010, the NME named Greenwood one of the greatest living guitarists. In the same year, he was voted the seventh greatest guitarist of all time in a poll of more than 30,000 BBC Radio 6 Music listeners. In 2011, Rolling Stone ranked him the 48th greatest guitarist of all time, and in 2012 Spin ranked him the 29th. In 2008, Greenwood's guitar solo in "Paranoid Android" was named the 34th best guitar solo of all time by Guitar World. Three of his solos ("Paranoid Android", "Just" and "The Bends") appeared in the NME's 2012 list of the best guitar solos of all time. In 1995 Greenwood married Israeli-born Sharona Katan, a visual artist whose work (credited as Shin Katan) appears on the covers of Greenwood's Bodysong and There Will be Blood soundtracks. Their first son, Tamir, was born in 2002 and the 2003 Radiohead album Hail to the Thief was dedicated to him. They also have a daughter, Omri, born in 2005, and a second son, Zohar, born in February 2008. Greenwood is red-green colour blind. He listed his favourite video games on Radiohead's website in 2010, including Ico, Elite and Red Dead Redemption. ↑ "Jonny Greenwood - Biography & History - AllMusic". AllMusic. Retrieved 2016-04-05. 1 2 3 Ross, Alex (20 August 2001). "The Searchers: Radiohead's unquiet revolution". The New Yorker. Archived from the original on 14 February 2008. Retrieved 22 February 2012. 1 2 "EP.22B - JONNY GREENWOOD (BONUSJONNYBITS)". SoundCloud. Retrieved 2016-06-22. 1 2 "Popcorn Superhet Receiver". Faber Music. Faber Music. Retrieved 18 October 2014. 1 2 3 "Jonny Greenwood, The First Time With... - BBC Radio 6 Music". BBC. Retrieved 2016-06-24. 1 2 3 ' David Fricke (26 April 2012). "Radiohead Reconnect – How the most experimental band in music learned to rock again". Rolling Stone (115). 1 2 "All Songs +1: A Conversation With Radiohead's Jonny Greenwood". Retrieved 2016-08-04. 1 2 3 "Jonny Greenwood on Penderecki, Messiaen and the BBC Concert Orchestra". ↑ McLean, Craig (14 July 2003). "Don't worry, be happy". The Sydney Morning Herald. Retrieved 25 December 2007. ↑ Lewis, Luke (24 March 2013). "This Is What Radiohead Looked Like In The '80s". Buzzfeed. Retrieved 24 June 2013. ↑ Jones, Lucy (26 March 2013). "9 Photos Of Artists Before They Hit The Big Time". NME. Retrieved 24 June 2013. 1 2 3 4 Randall, Mac (1 April 1998). "The Golden Age of Radiohead". Guitar World. 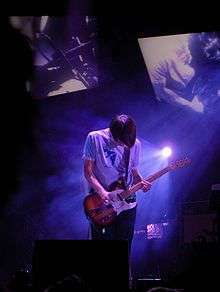 1 2 3 4 "Jonny Greenwood - 100 Greatest Guitarists". Rolling Stone. Retrieved 2016-06-22. 1 2 "100 Greatest Guitar Solos: No. 34 "Paranoid Android" (Jonny Greenwood)". Guitar World. 2008-10-28. Retrieved 2016-06-23. ↑ "Weird Fruit: Jonny Greenwoods Creative Contribution to 'The Bends'". PopMatters. Retrieved 2016-06-23. ↑ Reynolds, Simon (July 2001). "Walking on Thin Ice". The Wire. Retrieved 17 March 2007. 1 2 3 Nic, Harcourt (12 October 2000). "Radiohead — Morning Becomes Eclectic". Morning Becomes Eclectic (Interview). Jonny and Colin Greenwood. KCRW. 1 2 "Thom Yorke Talks About Life in the Public Eye". 2006-07-12. Retrieved 2009-03-29. 1 2 3 McNamee, David (2009-10-12). "Hey, what's that sound: Ondes martenot". the Guardian. Retrieved 2016-06-22. ↑ "Radiohead Revealed: The Inside Story of the Year's Most Important Album". Melody Maker. 29 March 2000. Retrieved 18 March 2007. ↑ "Radiohead Warm Up with 'Amnesiac'". Rolling Stone. 2001-05-24. Retrieved 2016-06-06. 1 2 3 4 5 6 Pappademas, Alex (2012-03-09). 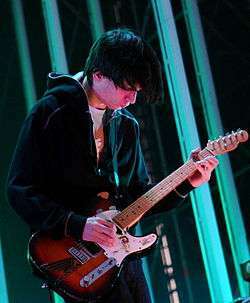 "Jonny Greenwood, Radiohead's Runaway Guitarist". The New York Times. ISSN 0362-4331. Retrieved 2016-06-22. ↑ Zoric, Lauren (October 2000). "Fitter, Happier, More Productive". Juice. ↑ "BBC - (none) - Hear And Now - Ether Festival". www.bbc.co.uk. Retrieved 2016-06-21. 1 2 3 4 5 6 7 8 9 "The Quietus | Features | A Quietus Interview | Music (For A Film): Jonny Greenwood Of Radiohead Interviewed". The Quietus. Retrieved 2016-06-22. ↑ "Radiohead Announce New Album Release Date, Share "Daydreaming" Video | Pitchfork". pitchfork.com. Retrieved 2016-05-06. ↑ Larson, Jeremy D. "Radiohead's A Moon Shaped Pool: The 5 Most Important Things To Know". Pitchfork. Retrieved 9 May 2016. ↑ "British Composer Awards 2006 – Nominations". Retrieved 22 March 2009. ↑ Beard, Matthew (25 November 2006). "Radiohead guitarist takes prize in Radio 3 awards". The Independent. London. Retrieved 22 March 2009. ↑ "Best of British". 2 April 2008. Retrieved 22 March 2009. ↑ Tapley, Kris (15 October 2007). "Red Carpet District". Variety. Retrieved 22 March 2009. ↑ Martin, Peter (22 January 2008). "Eight is Not Enough: Jonny Greenwood's 'Blood' Score DQ'ed". Retrieved 22 March 2009. ↑ "Best Films of the 2000s". Rolling Stone. Retrieved 2016-08-26. ↑ "I am Hans Zimmer, back on reddit once more. Ask me anything! • /r/IAmA". reddit. Retrieved 2016-11-26. ↑ "Jonny Greenwood Is The Controller". Stereogum. 2007-02-22. Retrieved 2016-06-23. ↑ "Various Artists: Jonny Greenwood Is the Controller Album Review | Pitchfork". pitchfork.com. Retrieved 2016-06-23. ↑ "Dead Air Space". radiohead.com. 22 June 2008. Retrieved 8 March 2011. 1 2 Carlick, Stephen (5 March 2010). "Radiohead's Jonny Greenwood Scoring Film Adaptation of Haruki Murakami's Norwegian Wood". exclaim.ca. Retrieved 6 March 2010. ↑ Kemp, Stuart (14 February 2011). "Radiohead's Johny Greenwood to Score 'We Need to Talk About Kevin' (Berlin)". The Hollywood Reporter. Retrieved 14 February 2011. ↑ "Jonny Greenwood Scoring PT Anderson's The Master". Stereogum. 6 December 2011. Retrieved 2 October 2012. ↑ Michaels, Sean (23 January 2012). "Jonny Greenwood reveals details of Krzysztof Penderecki collaboration". The Guardian. London. ↑ Magnay, Jaquelin (26 September 2014). "Radiohead guitarist Jonny Greenwood and the ACO". The Australian. ↑ Michaels, Sean (7 October 2014). "Radiohead's Jonny Greenwood hires Supergrass to cover Inherent Vice track". The Guardian. Retrieved 15 October 2014. ↑ "Radiohead's Jonny Greenwood Performs with the London Contemporary Orchestra | Pitchfork". pitchfork.com. Retrieved 2016-06-23. ↑ "Blind Mr. Jones | Biography & History | AllMusic". AllMusic. Retrieved 2016-06-22. ↑ "The Quietus | Features | Rock's Backpages | A Pavement Interview: Terror Twilight, Radiohead, & Going Overground". Retrieved 2016-06-25. ↑ "Frantic - Bryan Ferry | Songs, Reviews, Credits | AllMusic". AllMusic. Retrieved 2016-06-21. ↑ "Jonny Greenwood, Flea, Roxy Music (Including Brian Eno!) Join Bryan Ferry On New Album". Stereogum. 2010-07-12. Retrieved 2016-06-21. ↑ "Break Yo' TV: Harry Potter's The Weird Sisters – "Do The Hippogriff"". Consequence of Sound. 2010-11-18. Retrieved 2016-06-22. ↑ "Jonny Greenwood collaborates with Israeli singer". Idiomag.com. 17 January 2009. Retrieved 5 February 2009. ↑ "Hear Thom Yorke, Jonny Greenwood, and DOOM: "Retarded Fren"". Retrieved 28 April 2015. 1 2 "Radiohead's Jonny Greenwood on performing with Shye Ben-Tzur at The". Evening Standard. 2014-05-16. Retrieved 2016-06-22. ↑ "Screen Junkies". www.screenjunkies.com. Retrieved 2016-06-22. ↑ "Paul Thomas Anderson is making a documentary about Radiohead's Jonny Greenwood". The Verge. Retrieved 2015-12-17. ↑ "Junun | New York Film Festival". Film Society of Lincoln Center. Retrieved 2016-06-22. ↑ "Frank Ocean's New Visual Album Endless Features Jonny Greenwood, James Blake, More | Pitchfork". pitchfork.com. Retrieved 2016-08-19. ↑ Needham, Alex; editor, US arts (2016-08-20). "Frank Ocean releases long-awaited album, Blond". The Guardian. ISSN 0261-3077. Retrieved 2016-08-21. 1 2 "Radiohead's Jonny Greenwood Talks A Moon Shaped Pool, Pixies, Pavement, More in New Interview | Pitchfork". pitchfork.com. Retrieved 2016-06-25. ↑ "Source". Citizeninsane.eu. Retrieved 27 September 2014. ↑ "Jarvis Cocker's Sunday Service: Colin Greenwood, Jonny Greenwood and Adam Buxton sit in". BBC 6 Music. BBC. Retrieved 31 May 2015. ↑ "Sonic Youth Dirty T Shirt". nostalgeec. Retrieved 31 May 2015. ↑ "Steve Reich: Radio Rewrite Album Review | Pitchfork". pitchfork.com. Retrieved 2016-08-29. ↑ "Radiohead's Jonny Greenwood 'Too Shy' to Join Reunited Post-Punks Magazine". exclaim.ca. Retrieved 2016-06-23. 1 2 3 4 "Jonny Greenwood is the controller: Typewriters & washing machines". www.sunday-guardian.com. Retrieved 2016-06-22. ↑ Dunlevy, T'cha (13 March 2013). "Review: Le chant des Ondes". Montreal Gazette. Retrieved 28 November 2014. ↑ Pask, Andrew (2 January 2014). "Mini Interview: Jonny Greenwood". Retrieved 4 January 2014. ↑ Barrett, Neil (19 March 2015). "Jonny Greenwood's Creative Contribution to 'The Bends'". Retrieved 8 August 2016. ↑ Reynolds, Simon (July 2001). "Walking On Thin Ice". The Wire. Retrieved 8 August 2016. 1 2 NME.COM. "The Greatest Guitarists Alive Today | NME.COM". NME.COM. Retrieved 2016-06-22. ↑ "SPIN's 100 Greatest Guitarists of All Time | SPIN - Page 7". Spin. 2012-05-03. Retrieved 2016-06-22. ↑ NME.COM. "50 Greatest Guitar Solos | NME.COM". NME.COM. Retrieved 2016-06-23. ↑ "Radiohead's Jonny Greenwood lists his current top 10 video games, cherishes ICO". The Independent. London. 4 June 2010. Retrieved 8 May 2016. While the list stretches all the way back to 1984 with the enormously influential Elite, there's also room for May 2010's Red Dead Redemption. Though ICO may be the all-time favorite, it's certainly Red Dead that's now taking up day-to-day gaming time. ↑ "smear". Faber Music. Faber Music. Retrieved 18 October 2014. ↑ "'I'm going to drive everyone slightly crazy'". theguardian. Retrieved 18 October 2014. ↑ "There Will Be Blood (live film version)". Faber Music. Faber Music. Retrieved 18 October 2014. ↑ "Doghouse". Faber Music. Faber Music. Retrieved 18 October 2014. ↑ "Suite from Norwegian Wood". Faber Music. Faber Music. Retrieved 18 October 2014. ↑ "48 Responses to Polymorphia". Faber Music. Faber Music. Retrieved 18 October 2014. ↑ "Suite from 'There Will Be Blood'". Faber Music. Faber Music. Retrieved 18 October 2014. ↑ "Water". Faber Music. Faber Music. Retrieved 18 October 2014. Wikimedia Commons has media related to Jonny Greenwood.